Naturopathic Consultant Jem Friar presents a small 124-page booklet with information about the health benefits of juicing and dozens of fruit and vegetable juice recipes. Friar begins with a series of brief chapters addressing why he believes juicing is an important part of a healthy lifestyle. He covers issues including why juicing is great, how to choose the best juicer for your needs, what a juicer's kitchen kit needs to include, tips and tricks for making juicing easier, and how to help kids love fresh juice. He then divides his recipes into two categories: fruit-centered recipes and vegetable-based juices. Friar's fruit juices are designed to be both light and cleansing and a healthier alternative to the standard American diet which often includes an excessive amount of sugars and sweeteners. Because of this, Friar hopes these juices will have greater appeal as a healthier alternative to readers looking to cope with health issues like obesity and Type-II diabetes. 25 fruit-centered juice recipes are included. Though simple to make and clearly printed, the book lacks visual appeal and would have benefitted from brightly colored pictures as shown on the cover (while the book contains some small pictures, everything is black-and-white and the design looks similar to self-published e-book format). Juice recipes here include a wide variety of flavors like melons, herbs, berries, citrus, ginger, cucumbers, and a large number of other fruits (kiwis, apples, pears, pineapple, peaches, etc.). That being said, some of the recipes feel highly simple--easy to make, but nothing someone familiar with juicing couldn't concoct on their own. The best looking recipes here include "Sweet and Sour" (a combination of pineapple, cranberries, and lemon and lime juice) and "Sunset Soother" (pomegranates and oranges)--definitely delicious, but nothing revolutionary. Friar's 29 vegetable-based juices promise to boost energy levels, help cell heath, and cleanse the body. These recipes seem to be more helpful to someone looking to try out new flavors and vegetable combinations. The ingredient diversity here is much wider: peppers, carrots, broccoli, radishes, fennel bulbs, spinach, beetroots, celery, parsnips, sweet potatoes, watercress, lettuce, zuccini, kale, peas, beet greens, bok choy, chard, cucumbers, garlic, plus herbs and fruit added in here and there. If you're a fan of standard V8, you'd likely enjoy these. If you're more a fan of balancing vegetables with fruit combinations, you'd need to do some experimenting on your own using Friar's recipes as a jumping off point. 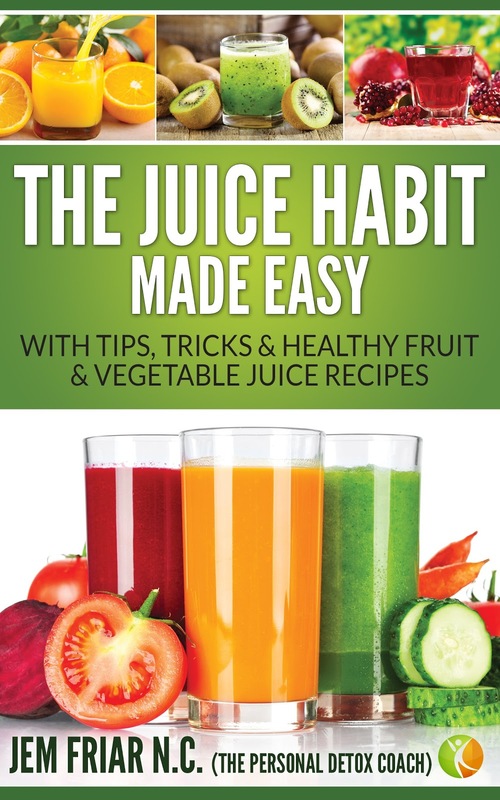 If you're looking for some vegetable-based juice recipes, The Juice Habit Made Easy is worth checking out from your local library or borrowing from a friend, but not one I'd recommend purchasing. If you're more interested in fruit juices or balanced combos, I'd skip this one unless you're interesting in checking out the introductory tips Friar provides. Note: I received this book for free through Goodreads First Reads.